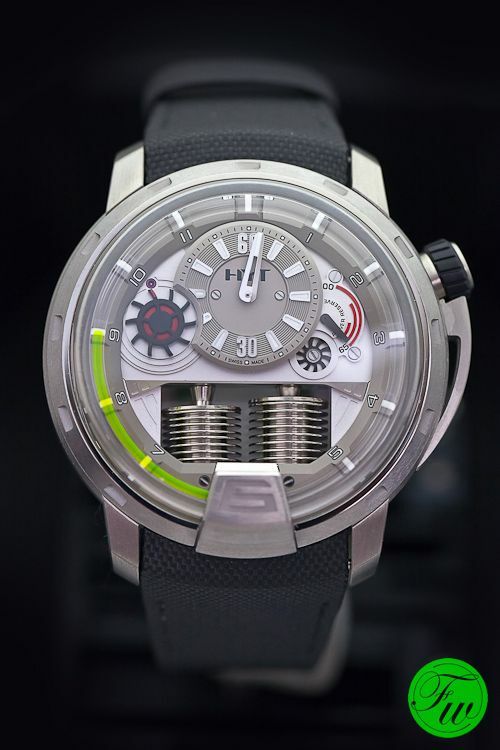 One of the big surprises of BaselWorld was the H1 timepiece by HYT. Fine watchmaking meets hydromechanics as they like to put it. 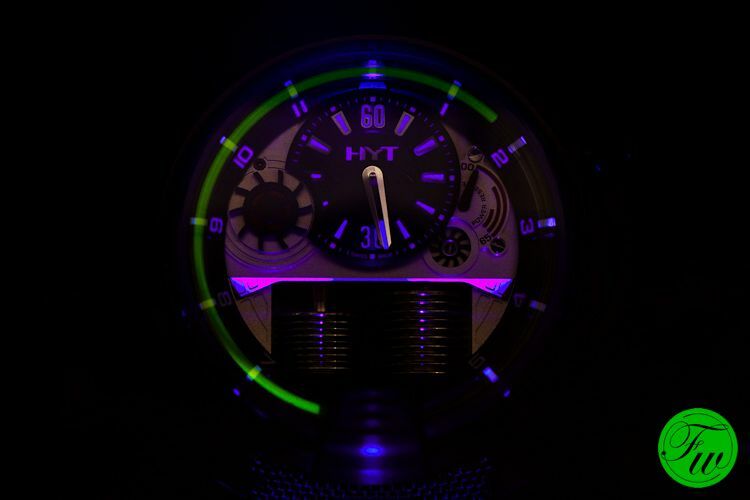 We got an appointment with HYT to see their H1 watch up close and personal to see what the fuzz was about. We’d seen some previews of the watch in January, but we just shrug our shoulders. Well, seeing is believing! 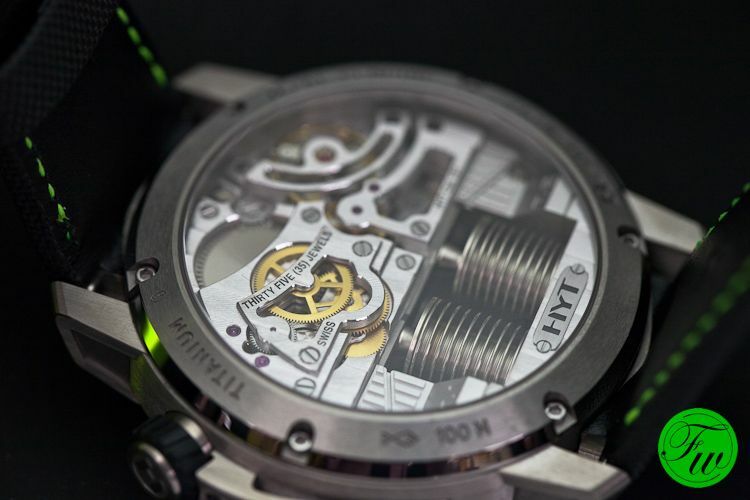 HYT’s H1 timepiece is just incredible. The liquid filled capillary tubes gives the watch not only a very futuristic and almost unreal presence, it actually works! This watch is meant for those who already have their Patek Philippes, Vacherons, Jaegers or even Richard Milles and want something totally different and innovative in terms of watchmaking. We can’t remember of another watch manufacturer using a hydraulic system like HYT’s and combine it with traditional watchmaking. As you’ve probably guessed already, the fluorescent liquid filled capillary tube is showing the time. This liquid is being ‘pushed’ by the compressed reservoir. There is another liquid inside, with a different color that makes sure the other reservoir is being filled as the first reservoir pushes the colored liquid around. So, the reservoirs have this mechanism in place that control the fluid going back and forth in the tube. 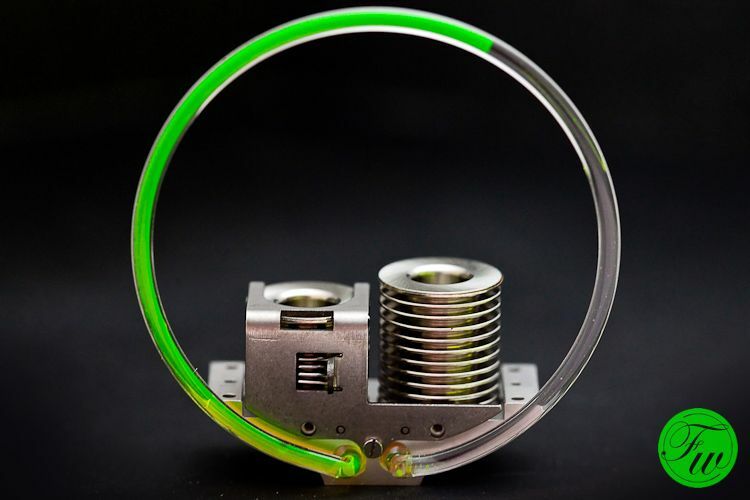 When the colored liquid has gone around the watch till 18:00, it flows back in the reservoir. Like a fluid retrograde. 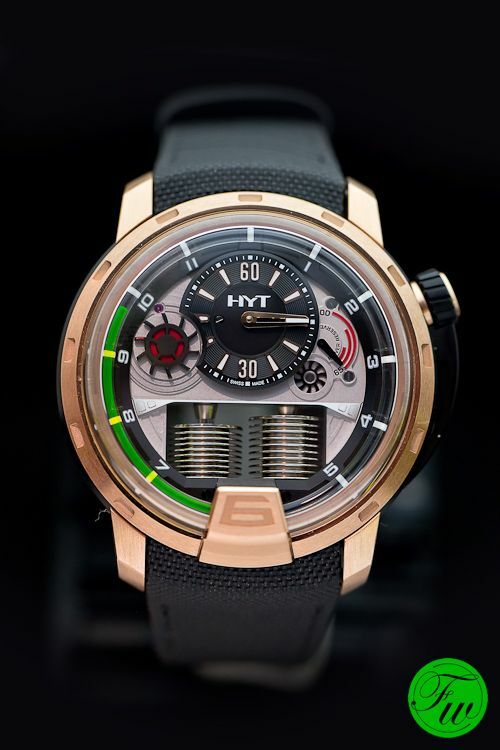 An interesting concept of which the technical details are either a secret or are one of those that have been patented by HYT to protect the technology and design of the H1. 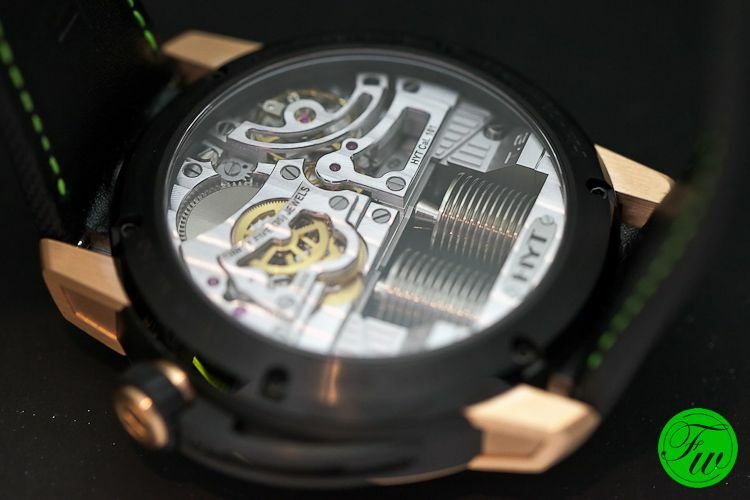 In total, HYT applied seven patents for this. The H1 comes in a few models, starting at approximately 40.000 Euro. There will be a H1 in Diamond-Like-Carbon (DLC), Titanium and pink gold. 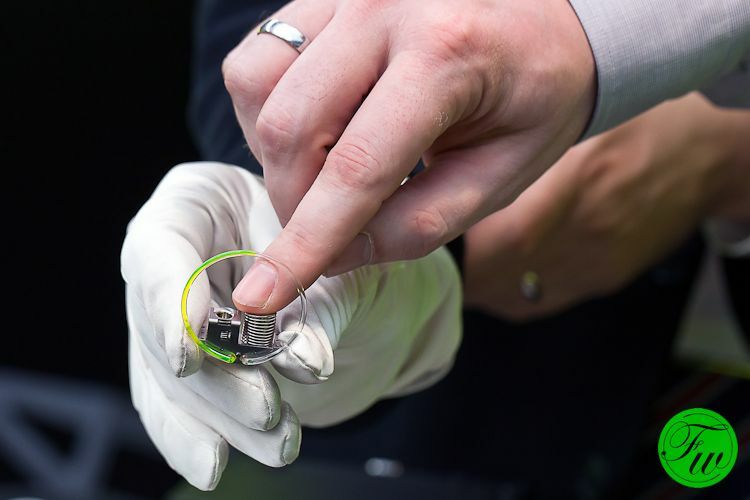 We’ve found the watches to be quite wearable with its dimensions (48.8 x 17.9 mm) and looks. We think [and hope] that the future owners will certainly make no safe-queen out of these babies. Something we see happening a lot with the complicated timepieces from the traditional manufacturers. 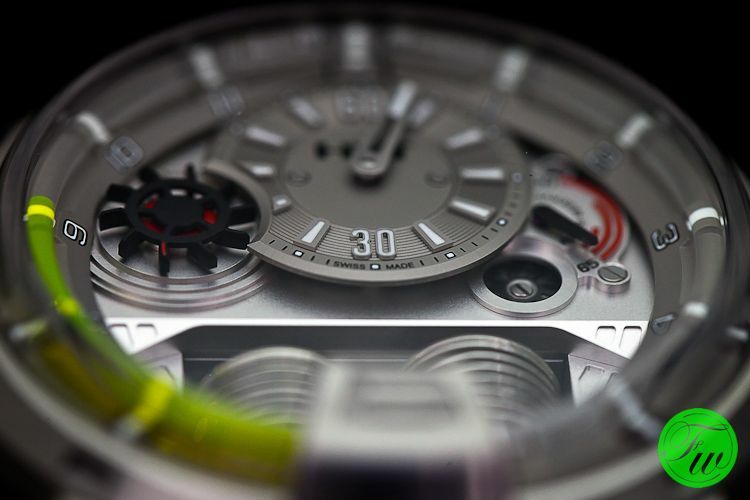 The HYT H1 is there to be worn and shown. If we see one in public, we won’t hesitate to start a conversation.